Dressed-up cyclists rode in cities all around the world this weekend — including Montreal — as part of Greenpeace’s Arctic campaign. Despite the rain, about 50 people met Saturday afternoon in Laurier Park for the Ice Ride organized by the non-governmental environmental organization. 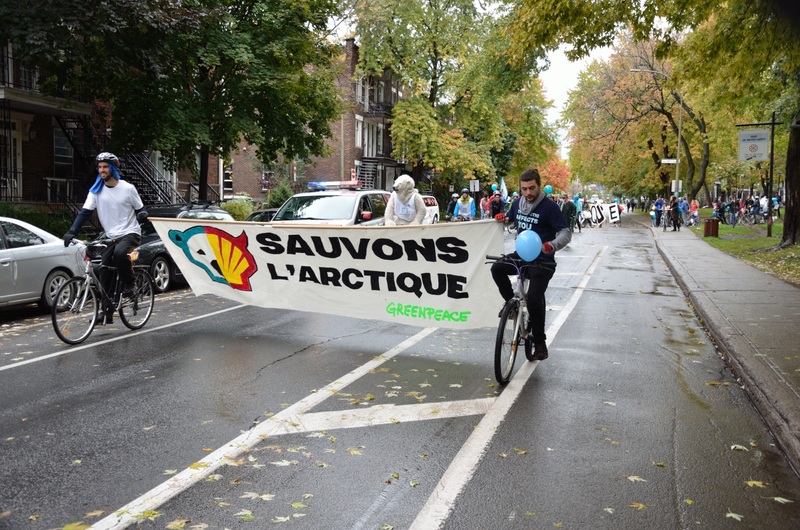 After decorating their bikes and dressing up as polar bears, the riders went along a 12 km ride hoisting 16 letters spelling “Sauvons l’Arctique” (save the arctic). This ride followed the International Declaration on the Future of the Arctic launched in 2013 by Greenpeace. The declaration explains what the protection of the Arctic should be and was signed by well-known Canadians like David Suzuki and Margaret Atwood and will ultimately be presented to the leaders of the Arctic Council as well as to representatives at the United Nations. “Definitely, [the Ice Ride] is a people’s mobilization targeted to our politicians and the leaders of the Arctic states as well as the entire world,” Latimer said. The Ice Ride happened in 150 towns around the world; Thailand’s efforts brought 1,200 people in Phitsanulok and created one of the biggest showings. “We did a poll this summer that showed that three-quarters of people wanted the Arctic protected,” Latimer said.